Setting and Accomplishing Financial Goals! 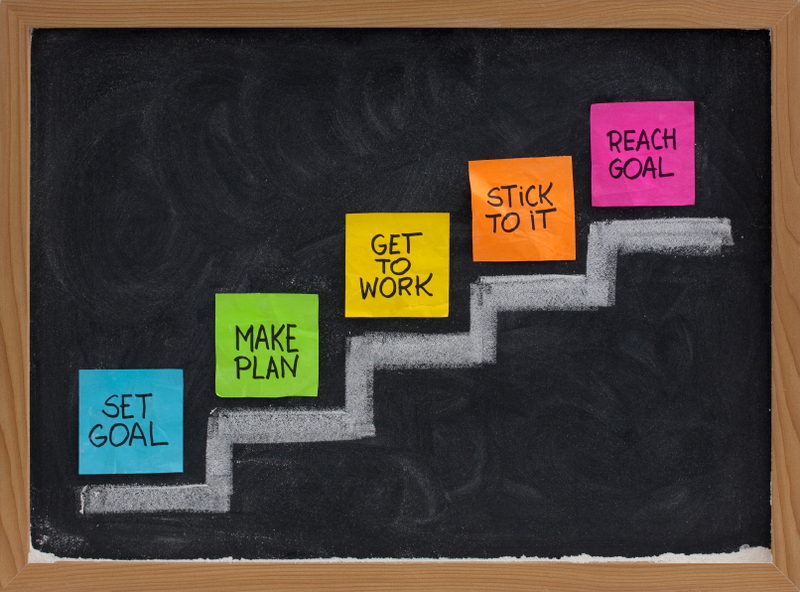 Setting and accomplishing goals are so important. They boost your confidence and improve your overall attitude. Setting goals and following through can be difficult so I thought I’d let you all know how I go about setting goals and trying to accomplish them. Figure out what your goals are. Sit down and REALLY take time to think about it. Also, include your family in on your thinking process. You know what they say, “family knows best”… sometimes. Give yourself a realistic time frame to achieve these goals. Your short-term goals may take you 1-2 years or even 5 years to complete. Don’t get discouraged because time flies! Once you figure out what it is that you want to accomplish and when, the next step is to make a list of things you’re going to need to give up in order to get there. You may need to cut down on yearly vacations and just go every other year. Or it may be something as simple as not going out to eat multiple times a week. Whatever it is that you need to give up, list it below your goal. Some of the things you need to give up my affect your family so make sure you talk to them about it. If you have children, explain to them that accomplishing goals are important and sometimes giving up certain guilty pleasures will help accelerate you to your goal. Younger children may not understand so cut back on family events that cost a lot of money like going to the movies, which all of a sudden costs an arm and a leg! When I was growing up it was like $5.50 to go see a movie and now it’s $10-$12 and if you’re a senior citizen, that’ll save you, what, $.25? Woopty-doo! And don’t even get me started on the price of 3D movies! Just because you spent $500 million making the movie Avatar, James Cameron, doesn’t mean you can charge us the same price just to go see it. Sorry for the randomness! Anyways, instead of taking the family to the movies have a movie night at home with a $1 red box movie and some good old fashion Orville Redenbacher. When the weather gets nicer check around your area to see if there’s any outdoor movie theaters or drive-ins. Also, summer is theme park season and the price of admission gets crazier every year. Kids always want to go multiple times but let them know that they can only go once or twice this summer and tell them to choose wisely. Lastly, you’re going to need to review and re-prioritize your goals regularly. There’s going to be unavoidable setbacks. Also, some of your goals may seem unimportant after awhile so replacing one goal for another is not a big deal as long as you keep working towards something. Go on & ship your pants! Organizing has never been so SAFE! Happy President’s day everyone! Hope that you all had a great weekend. I know I did! I just got home a little while ago from my weekend at home with the family. I had an awesome time and got to see a lot more of my family than I thought I would have, which is always great. Anyways, I was checking my e-mail this afternoon and saw the cutest thing from Groupon! It’s an organizer in disguise! 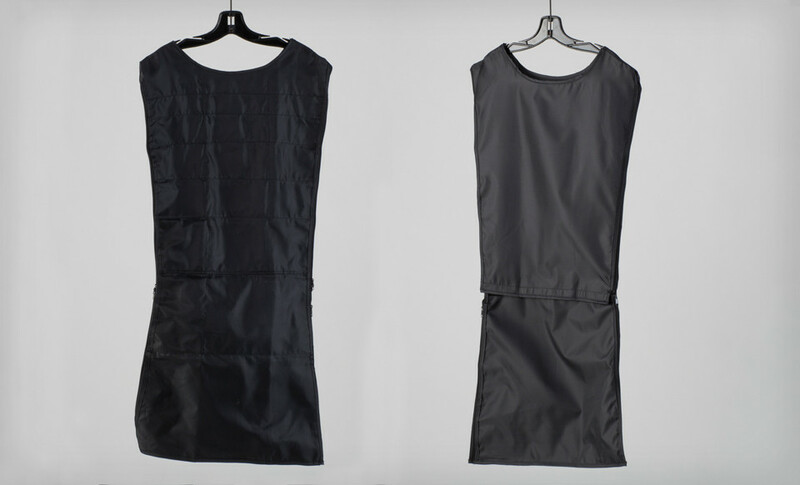 Groupon calls it the U.S. Patrol Hanging Dress Safe. Although I wouldn’t really call it a “safe” it is a pretty cool idea in hiding some of your valuables. 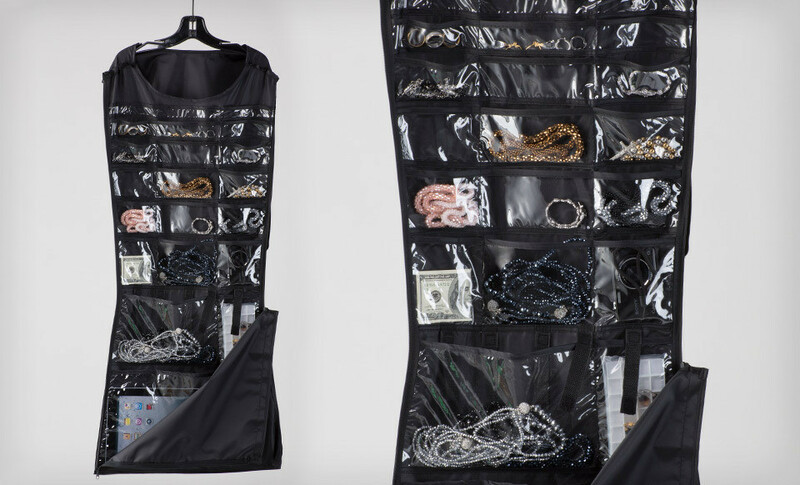 For $12.99 + $2.99 shipping, you get two of these dress organizers. I may have to get it only because my closet is so jam packed with stuff that no one would even imagine that this extremely hideous dress is holding all of my valuables. If you’re interested in purchasing one of these, you can click right here, but hurry up because the deal is only on for the next day or so. Here we are again! With the last and final part of the financial spreadsheet. With this Yearly Budget Spreadsheet you’re going to be able to track all of your spending all in one place! In order to be able to complete this spreadsheet, you’re going to need to finish the Monthly Budget Spreadsheet, first. If you need that template, let me know! It looks similar to the Monthly Spreadsheet, right? Well, it’s supposed to. The first column should be labeled ‘Budget’ and this is where you’re going to input all the information that you have on your ‘Monthly Budget’ spreadsheet. All of the same amounts, same categories, etc. I’ve added ‘Additional Income’ to this category, but you want to make the monthly budget $0.00 because you don’t want to expect any additional income, but if you get it, you have somewhere to put it. I use ‘Additional Income’ on my personal spreadsheet because my husband works in sales and often gets a commission check so I put that commission check amount in this spot. So if you or your partner get commission or maybe you sell stuff on Ebay or have a little side business going where you make funky bracelets or something crazy, I dunno.. you might just want to put this extra row on your sheet. You’re just going to label the next columns with the upcoming months and you’re going to keep track of how much you spend in each category. Remember when I said to make a Monthly Bill Binder? Well this is where it would come in handy. You keep all your bills together when you get them and then sometime near the end of the month, take a half hour on a Sunday morning and go through the binder. Input all the totals from your bills, grocery receipts, pay stubs, etc. It doesn’t take long at all. Add them all up and see how you did this month. I’m going to explain the sample sheet a little further. These are the ‘Household Expenses’. As you can see in the sample, some of the expenses may fluctuate like I said in the Monthly Budget post but all you need to do is just type in the exact amount when you receive the bill. You can see that on the Yearly Budget Spreadsheet I’ve added a category that I didn’t have on the Monthly Spreadsheet and that is ‘Miscellaneous’. I consider Miscellaneous to be trips to Target for household supplies or beauty items, stuff like that. Also, let’s say you have to go to a birthday party this month and you need to buy a gift for someone. I would put that total under ‘Miscellaneous’ also. ‘Gas’ and ‘Maintenance’ will probably be the only categories under Automobile that will change much. One month you may get an oil change, the next month you wont, and maybe the next month your tire blows out and you need to purchase a new one. Those are pretty crazy fluctuations. Add them to your sheet to keep it together! Your liabilities can be different every month also. Like I said in the Monthly Budget, you’ll want to just put what you’re comfortable with spending. Some months you may want to pay more based on how much income you’ve got and some months you may feel better paying less. 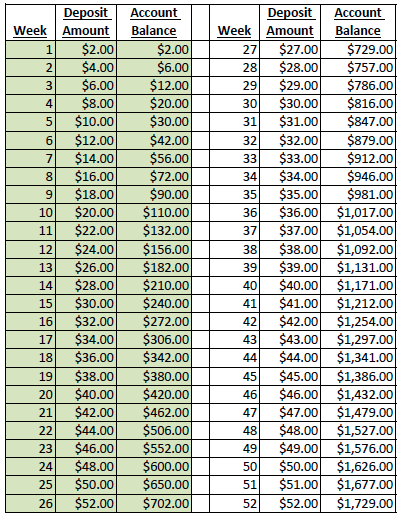 Savings will change, most likely every month, so you can be prepared for that with this spreadsheet. At the end of the year it will be awesome to see how much money you’ve put away! Isn’t this so inspiring? This is how you can see how much money YOU can save each month if you just STICK TO THE BUDGET! And that’s the trick! Not this spreadsheet or the planners or the binders. 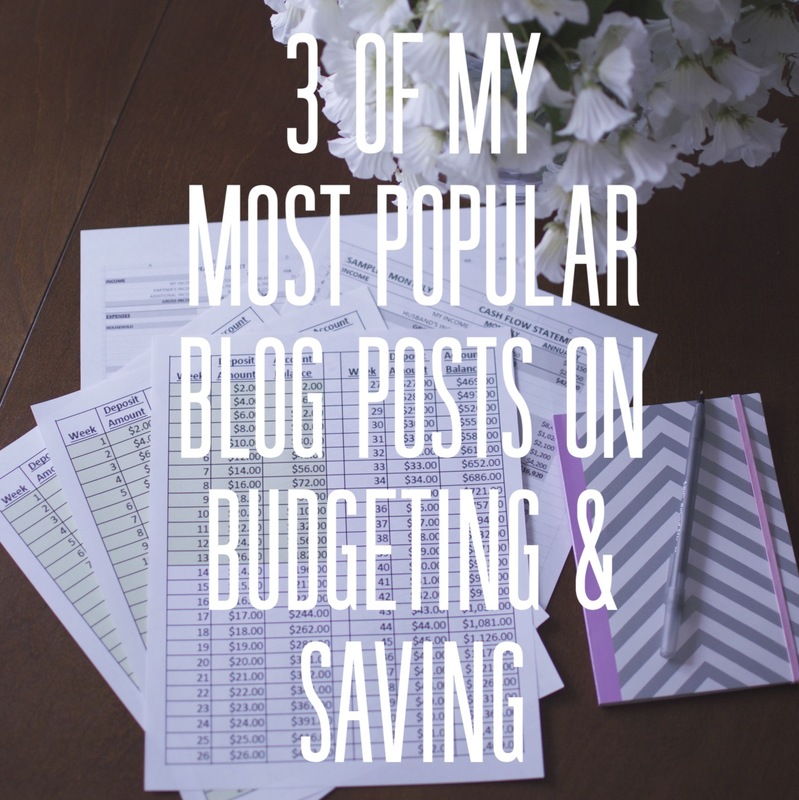 Sticking to the budget is definitely what you need to be doing. People think that coming up with the budget and keeping everything organized is the hard part, but it’s not even close! These spreadsheets are just going to help you stick to it! I was actually thinking yesterday that if you made these spreadsheets and then kept cash for things that you’ll be buying in separate envelopes, kinda like the ‘Envelope System‘ that She Makes Cents wrote about, it might work really well! Most people pay for their bills like cable, electric, rent, cell phones, etc either online or by check, so you would keep that money in the bank. But let’s say you take out money for food, entertainment, and miscellaneous things and put them into their own labeled envelope and once those are gone, they’re gone. Except for maybe food. If you need more money for food then I think it’s ok to take out some more, unless you’re going out to eat all the time or getting fast food, then it’s a no-no. That way, you’re only using your bank account to pay for bills and then you’re using the cash in your envelopes for things that you may typically get carried away with. Because I KNOW that if I walk into Target and see a bunch of stuff I want I’m going to pull out that debit card or credit card and tell them to charge it!… But if you go in there with your envelope and you see how much money you have left to spend for the ENTIRE month, you may think twice. I think I’m going to try this next month and I’ll let you know how I do. If you try it or already do something similar, let me know! We’ll do this like the last time. If you’d like the Excel spreadsheet template, the PDF template, or the GoogleDocs version, let me know either in the comments or email me at kate@coordinatedkate.com. If you leave me a comment please be sure to also leave me your email address! If I sent you the Monthly Budget Spreadsheet, then I have your email and I’m going to just automatically send you this one so that you don’t even need to bother asking for it! Coordinated Kate’s first week on wordpress has been CRAZY to say the least! I’ve started several blogs before and I’ve never started one that had as big of a bang as this one. I’m getting so much love from my followers and random comment posters and I really appreciate it. I’m trying to answer all the emails I’m getting about wanting the template for the spreadsheets so if you haven’t gotten one yet, I promise you’ll be getting them shortly. I also made a note of everyone I’ve been emailing the templates to and when I publish the second part of the spreadsheet known as the ‘Yearly Budget Spreadsheet’ I’m going to automatically send it to all of you. I also want to thank She Makes Cents! She has such an amazing site and great information to share with everyone! She’s reblogged my posts not once but twice and really helped spread my information to a lot of her amazing followers, so I’m definitely grateful for that. I promise there is more great information and creative ideas coming. So keep checking in! I know, I know, the word “spreadsheet” often sends chills up my spine and I break out in a cold sweat, but I promise, this is soooo simple! And if you follow any suggestions from any of my posts, it should be this one. Seriously! Isn’t it beautiful?! This is a sample of a budget sheet I had prepared for someone and I rounded the numbers a little just to make things a little easier. This spreadsheet is GREAT if you’re just starting out and you’re not sure what you can afford or not. It’s even great if you’re not just starting out and you’re just looking to cut down in some places and save more money! I’m going to break it down for you so that it’s a little easier for you to make your own. 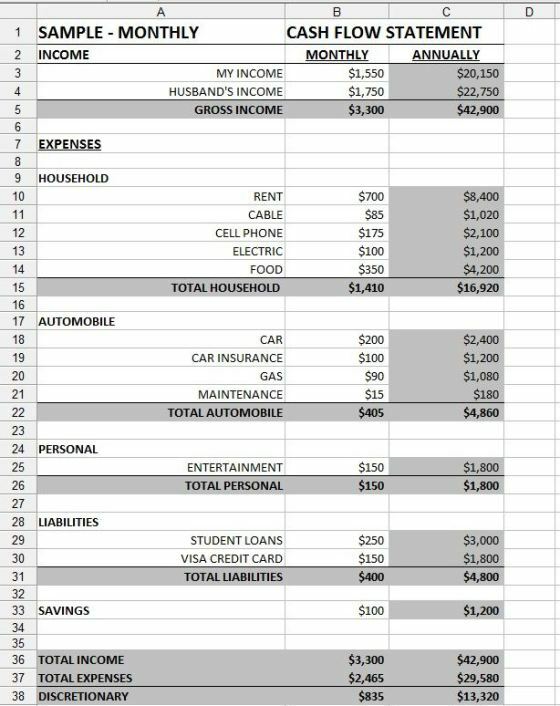 It’s easy, just be realistic about how much you plan to spend in certain sections like: food, entertainment, savings, etc. Don’t expect to only spend $20 for entertainment a month if you know that you go out to eat twice a week. 1. You want to start out with your monthly income and the income of your spouse, partner, or maybe even a roommate. If you don’t receive a fixed monthly or weekly income then just estimate or average it out according to your previous paystubs. Then you want to add your income and the income of your spouse or roommate. 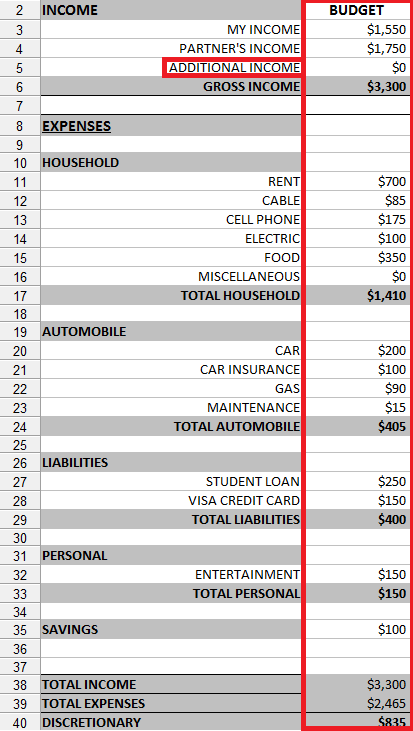 If you don’t have a roommate or spouse and this spreadsheet is just for you, then just add the total at the bottom. Then take your monthly income and divide it by 2 in order to get your bi-weekly income. Once you’ve done that, take that number and multiply it by 26 (if you get paid every two weeks) or by 24 (if you only get paid on the 15th and 30th of each month) in order to get your annual income. 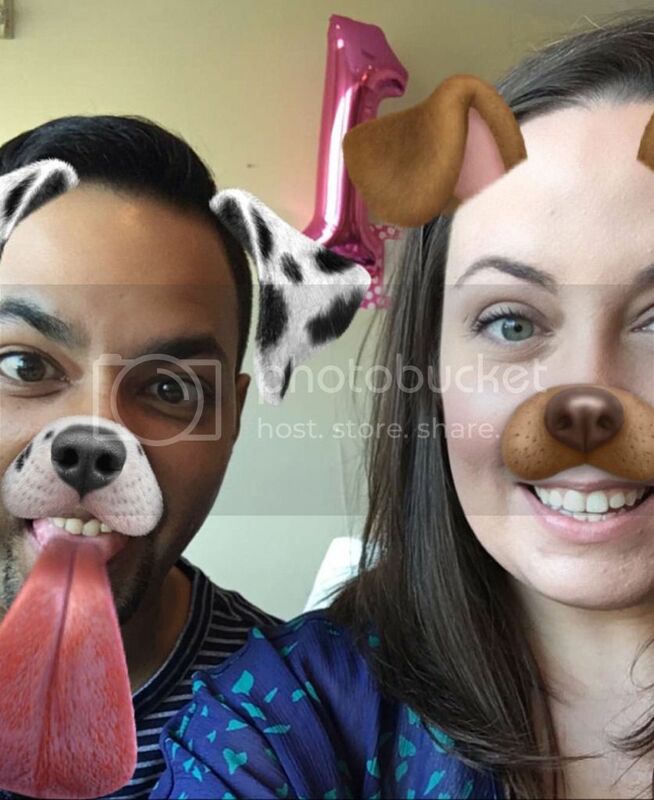 If you have a partner on this spreadsheet, do the same for them. Then, add it all up. Add both of your monthly incomes together and put the total and add both of your annual incomes and put that at the bottom of the ‘Income’ section. 2. Now it’s time to talk about expenses. You want to make a list of every single bill that you have during the month. 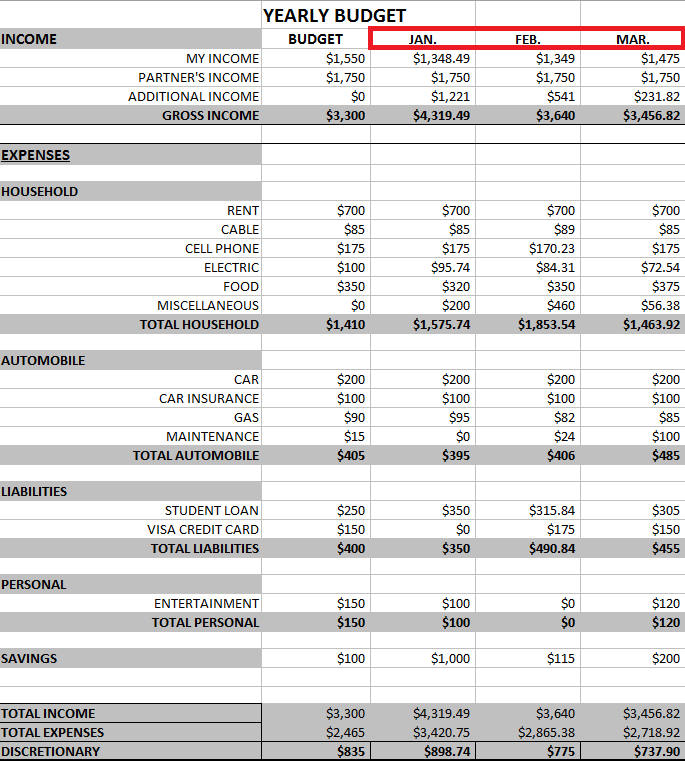 If you look at the sample there are expenses such as: rent, cable, cell phone, electric, and food. If you own a home you obviously won’t put rent. You will substitute that for a mortgage payment. Once you list all of the household expenses you want to put the exact amount that you pay each month under the ‘Monthly’ column. Once you’re done filing that in, go row by row and multiply those bills individually by 12. For example if you pay $850 a month in rent, multiply that $850 by 12 to get $10,200 for your annual expense. 3. Move onto the ‘Automobile’ section. Here you will want to list all expenses that have to do with your automobile. For example: Car payment, insurance, gas, and maintenance. Your car payments and insurance should be around the same price every month but your gas and maintenance may vary. I always pay for gas with my debit card so when my monthly statement comes in the mail, I add up how much I spent that month on gas, but for this you’ll want to either estimate or average off how much you spend. As for maintenance, I’m sure you’re not getting your oil changed or tires rotated every single month. Some months you may not spend any money on maintenance for your car but you want to put in some amount that you think is appropriate. 4. The next section is ‘Entertainment’. I consider entertainment expenses to be going out to eat, catching a movie, purchasing a video game, or anything that is a one time kind of thing. Allow yourself to have a certain amount of money every month for entertainment purposes. And remember, be realistic! 5. The ‘Liabilities’ section is important. This is for any credit card, student, or any other loan you might currently have. You may not pay the same amount every month but you want to give yourself a certain amount that you feel comfortable paying. That way if you want to pay a little more or a little less during a certain month, you won’t feel so bad. 6. My favorite and probably the MOST important part of this spreadsheet is the ‘Savings’ section. Every month you want to be able to put some amount of your income into savings. Whether it’s $20 or $200. Talk it over with your partner to see what you’re willing to put away every month and then enter that amount in the ‘Monthly’ column of your savings section. Multiple it by 12 to see how much you could be saving annually! If you don’t have a savings account or you’re looking for a better one, check out the ING Orange Savings Account. 7. This is the fun part. It’s like the “results” of the entire spreadsheet. ‘Total Income’ will just be your combined incomes from the top of the spreadsheet. ‘Total Expenses’ will be the total of all of your ‘Expense’ columns so you’ll need to add up your Household, Automobile, Personal, Liability, and Savings totals together to get that amount. Multiple them by 12 for the ‘Annual’ amount. To get the ‘Discretionary’ amount you want to subtract your ‘Total Income’ from your ‘Total Expenses’. Then the ‘Discretionary’ row is for any money that you have left over from your monthly expenses. Now you’ll get to decide if you want to adjust any of your amounts above. Let’s say that you only want to pay $150 towards your Visa CreditCard debt. Maybe now you want to increase or decrease that amount to make your discretionary amount bigger or smaller. You can also decide if you want to increase your savings amount, which I would prefer! And that’s it for the monthly budget spreadsheet! I told you it wasn’t so bad. I have the blank prepared excel spreadsheet in my Dropbox account so you can download the entire file here. Please email me at kate@coordinatedkate.com if you have any problems with the download. Any way that I can help, let me know! The next and final step to this financial organization project is the Yearly Budget Spreadsheet but you’ll need to have this monthly spreadsheet done first. 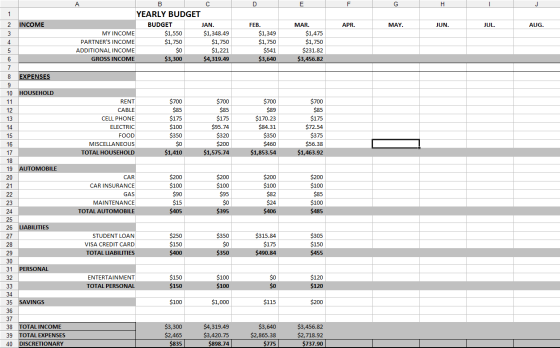 So work on becoming more financially aware and organized and I’ll be posting the yearly spreadsheet soon. UPDATE! 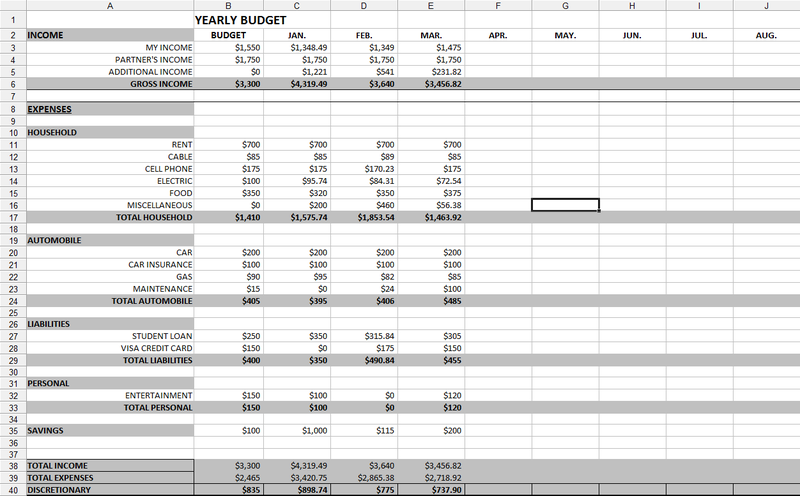 : Check out the Yearly Budget Spreadsheet here!